The advent of sites like Yelp, Angie's List, HundredX, Facebook, Google Reviews, and scores of others has absolutely changed the game in retail, especially for the food service industry. This means Customers will be drawn to— or driven from— your business before they even leave the house. When it comes to how merchants respond to this reality, the 'Goldilocks' paradigm holds true: Many businesses react 'too hard' and go overboard trying to "juice" their reviews. Many businesses simply ignore and dismiss it as part of the environment over which they have no control and a waste of time. But a chosen few do it just right, using feedback as fuel and picking up the many tools they've been given to turn 5-stars into their standard. Reviews happen. Becoming obsessed with getting good reviews can lead to wasting your time, or can get you into trouble. 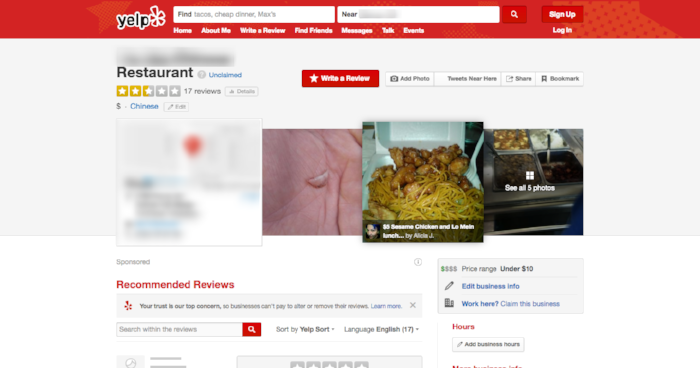 Sites like Yelp and Angie's List encourage their users to report promotions aimed at tampering with reviews e.g. giveaways for good reviews or refunds in exchange for positive writeups, etc. These types of schemes can lead to getting downright blacklisted. Similarly, overreactions to negative reviews can do far more damage than the reviews themselves. Even the nastiest, harshest review deserves a diplomatic, dignified response. And yes! You can respond. Most review sites let you 'claim' your business' entry and reply to reviews. So you can and should address reviewers and take a moment to make your business' page more appealing to potential Customers. It certainly makes you look far more professional if there are high-resolution images there to greet your Customers rather than blurry, outdated camera phone snaps. But let's digress back to responding to reviews. Negative reviews are going to happen and it's hard not to take them personally. But it's best to listen rather than defend. Even a completely unreasonable Customer can give you insight into your business' consistency, personnel, or practices. Whether you manage it or not. Your business has an online presence. If you're not the one managing it, the Internet is... and the Internet is merciless. Ignoring the fact that people are actively reviewing your business means you are losing out on a key demographic: people who use smartphones. Let's take a look at this in action. 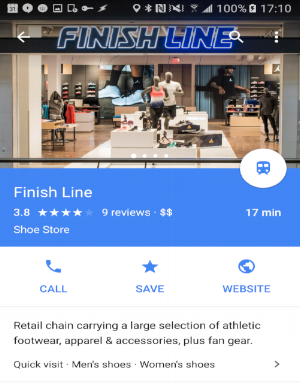 Your customer can pull up Google maps on their phone and look for shoe stores in their area. Let's say both of them have similar reviews. One has what looks to be an error in Google Street View, the other one actually has a crisp, professional-looking photo of their store which looks like a nice quiet place to get a quality pair of overpriced shoes. Probably the one without the nauseating photo of a human fingernail, I'm guessing. By the way, in our research, we learned that one of the locations for the fingernail place just closed down permanently. Restaurant B, however, just opened a new location right by the Shopventory offices. Learn how to better manage your inventory today with a full-feature 30-day free trial of Shopventory inventory management. Restaurant A hasn't even bothered to claim their Yelp page and at least reach out to apologize. Restaurant B has a few negative reviews, but each one has a reply with an apology, a promise to do better, and a hope to see that customer again. If someone is comparing lunch options, this is a no-brainer. See how much not paying attention to your business' online presence can cost you? First off, get your business registered on Yelp, Google, and whatever else's business pages (those links will take you straight to the business registration sections, by the way). It's also a good idea to get on Facebook and create an actual profile for your business. We do recommend updating social media at least once a week (sorry Twitter, we're working on getting better), but even if it's not going to be updated often, it still gives you credibility to have as broad an online presence as you can. Secondly, invest some time to manage your online presence daily. I know that sounds like a tall order, but a short amount of time spent on checking to see if there are any new reviews and responding to them in a timely and professional manner gets noticed. The number of people using these apps to make buying decisions is in the billions worldwide and will only keep growing. It only takes one of them to write a review that will cost you dozens of walk-ins and make the difference between a month in the negative and a month of profit. Goldilocks didn't have the life of a business riding on her, but there's really no substitute for 'just right', especially when your competitors are trying to attract those same customers. Like it or not, these review sites are here to stay and they reach your customers right where they are. They can be a source of free advertising (and who is a more convincing spokesperson than dozens of unbiased customers? ), or they can be a giant warning sign that wards off all future business (and who is a more convincing naysayer than dozens of unbiased customers?). You don't have control over what people write, but you do have control over whether underneath that occasional terrible review, your business is represented or has a say in the matter. There have been times where abusive customers posted nasty reviews and an honest explanation from the business actually turned the tide of supportive customers joining the business in its defense (this should be a very rare exception). But even a simple "I'm sorry you had that experience. Thank you for bringing it to our attention. We will take immediate steps to address this. Please come by again and give us another chance. Ask for _______ and he/she will personally see that you get taken care of," will make your business appear professional, forthright, and the sort of place anyone would still consider. Shopventory is here to help you be the best small business you can be. Our inventory management tools help tens of thousands of merchants worldwide manage inventory manage billions of dollars worth of inventory. So when a Customer does pick your establishment, you'll be ready with the merchandise they're looking for. Real-time stock Alerts, detailed Sales Reports, and up-to-the-minute Inventory Reports all come included for less than a dollar a day, with advanced features like Ingredient Tracking, Vendor Management, and Purchase Ordering available for a full-feature 30-day free trial and backed by live Customer Care and a 30-day money back guarantee. Know a small business who could use regular tips like these? Why not share this with them?